At the April Metro Mod Quilting Guild meeting, we were reminded that the deadline for the Alliance for American Quilts "Home Is Where the Quilt Is" contest was June 1. I liked the idea of making a very small quilt (15" wide x 19" high) in the shape of a house and thought I'd give it a try. My first time entering a quilting contest! Because we had so many quilts around when I was growing up, quilts have always felt like home to me--comforting and calming. A quilt is always a safe place to cozy up. I kept trying to think of a way to reflect that in a quilt, but kept coming up blank. 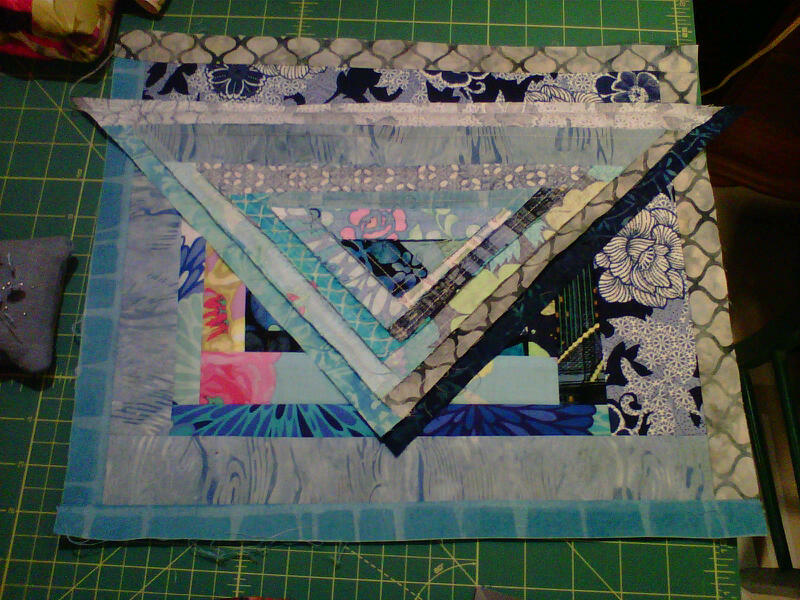 Then, after a particularly trying day at work, I came home looking forward to doing some quilting to calm and distract me from the frustration at the office. Before starting, I took a few deep, cleansing breaths...and then it occurred to me: quilting calms me just like yoga does. 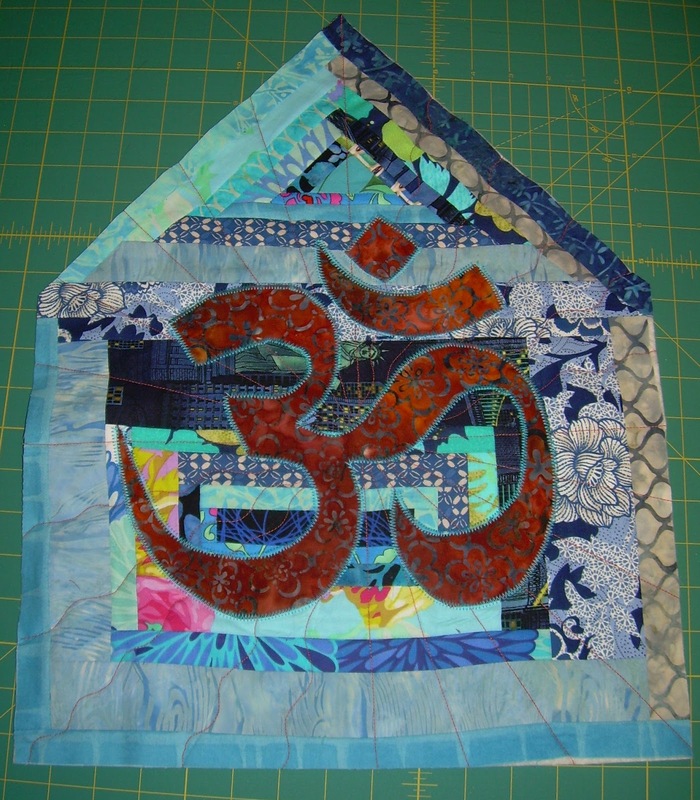 And that's when it hit me, "Om Is Where the Quilt Is." 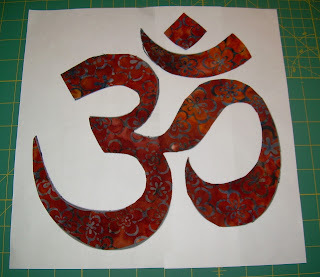 A sacred Sanskrit word, "om" is used at the beginning and end of a prayer or mantra, and is often intoned at the start and end of yoga classes. To me, it's an invitation at the beginning of class to refocus and calm myself, and a reminder at the end of class to take that focus with me. I'd been working on a few log cabin blocks, so I decided to to put together a wonky log cabin house in various shades of blues (a calming color for me) with an om symbol in a shade reminiscent of henna. I started the quilt in late April and was pleased with how quickly the base of the house (the rectangle) came together. The roof, my first log cabin triangle, was also pretty easy. House base with roof positioned for sewing. 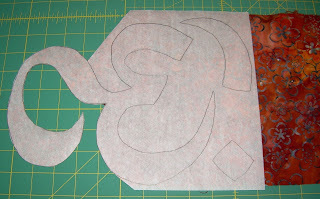 I'm not a big fan of applique, so I knew attaching the om symbol was going to be a challenge. I decided to use zigzag topstitching to save my sanity. Unfortunately, I'd never even done that before. So instead of looking online for a tutorial or some tips, I presumed I could find my way. 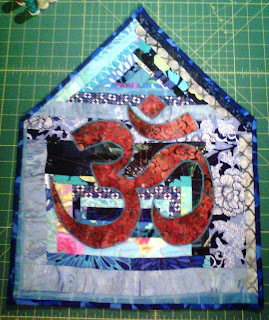 I went ahead and cut out the om and basted it to the quilt top. 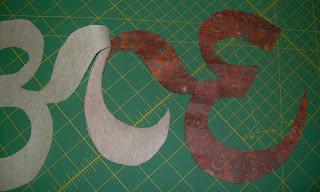 Then I started topstitching. As you can see below, it turned out horribly, with puckers aplenty. This was not a good plan. How NOT to machine applique. Discouraged, I put the quilt aside for a few weeks while I tried to figure out how to fix it (and to put off undoing all that topstitching!). I think I was reading a quilting magazine that mentioned fusible web and thought that might solve my problem. I also thought it might help with stability to quilt the house before attaching the om. So, I focused on quilting the house (I used straight and curvy lines radiating from the center), then I bought some fusible web (for lightweight fabrics), removed the old om, and cut out a new one. Then, following the instructions on the package, I attached the fusible web to the om (so simple--just lay the fabric on the web and apply pressure), and trimmed the web to the size of the fabric. ...positioned it on the house, and pressed using a hot iron. That om wasn't going anywhere! What a breeze it was to do the topstitching this time. No fighting fabric, and the results were exactly what I had in mind. I broke out my trusty copy of Happy Endings by Mimi Dietrich (I find I always have to consult the binding bible when I get to that point) and made and attached the binding. I'm pleased with how it turned out, although this photo (taken as I was rushing to get it in the mail before the deadline) is not fabulous. Hopefully it will look better at the exhibit! 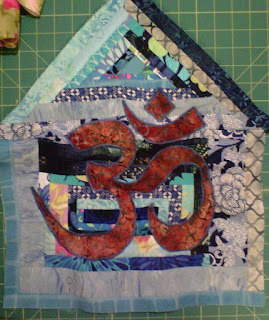 The houses will be part of a traveling exhibit through November, starting at the Original Sewing & Quilt Expo in Raleigh, North Carolina, then they'll be auctioned off to benefit the Alliance for American Quilts.